See You in the Big Room! SRV is trying out some new moves while building a hospital in Meilahti, Helsinki. The “secret weapon” at Siltasairaala hospital site is the co-working innovation Big Room where planners, builders and other insiders meet three days a week. With 71,500 square metres, Siltasairaala (Bridge Hospital) is the biggest construction project for HUS, the Hospital District of Helsinki and Uusimaa. The Bridge Hospital will replace Töölö Hospital and part of the Department of Oncology building and it will be included as a part of the operations of the other Meilahti hospitals, including emergency clinics. The construction effort for the hospital will conclude by June 2022. Project engineer Mikael Lähteenmäki from SRV says that the massive project is very much about cooperation. What this means, in practice, is that every Tuesday, Wednesday and Thursday all the key professionals involved in the project get together at Meilahti Big Room and assess what’s going on – and what needs to happen next. ”Typically we have 20 people there all day long. This way, it’s pretty convenient to tap somebody on the shoulder if you need an opinion on something,” Lähteenmäki says, adding that the improved flow of communication and flexibility are the best features of the innovation. An important part of the Big Room is the Last Planner method which steers short-term planning and oversight. 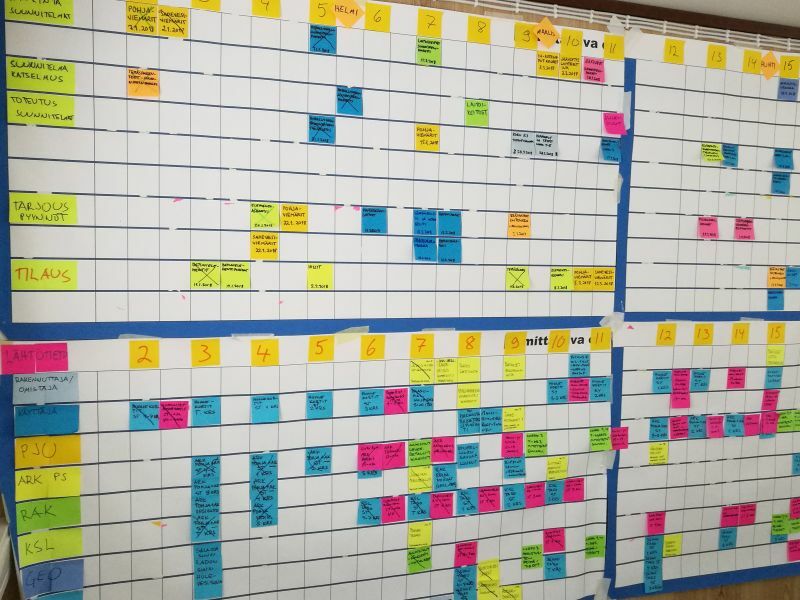 For example, every subcontractor puts a color-coded post-it note on the Last Planner wall to signify, what he/she aims to do next. Whenever there’s a big pile of post-it notes in one place, one must be aware of a potential bottleneck situation and plan ahead in more detail. ”At Meilahti, we have two Last Planner walls with one that features all the schedules of planning and acquisitions and one that has all production schedules,” Lähteenmäki explains. Lähteenmäki has experience on a couple of projects where Big Room has been deployed: an upgrade of an old building for the University of Helsinki and the concept renewal for the T2 terminal at Helsinki International Airport. For the first time, however, the Big Room was used by SRV when planning and building the shopping centre REDI which is set to open its doors in autumn 2018. SRV was very much interested about developing its co-working ways and asked help from Granlund Consulting. ”We were excited to be a part of creating a Big Room concept that would allow for smoother functions at the REDI work site”, says Piia Sormunen from Granlund Consulting. The Granlund team ended up spending an entire year with REDI, honing the concept into perfection. Sormunen has also experience from the T2 Terminal Big Room. “Presently, as construction projects are very quick tempo, bottlenecks often emerge when information does not travel fast enough. Big Room improves the situation a great deal as you’re able to tackle the challenges together,” Sormunen says. Lähteenmäki and Sormunen comment that the Big Room concept hasn’t met a lot of resistance, even though it takes some time getting used to – at least in the beginning. “It can be challenging to get everybody there at the same time which is the crucial element,” adds Lähteenmäki.